WARREN, Mich. — City officials in Warren, Michigan have agreed to allow an atheist display near an existing “prayer station” in city hall, settling a lawsuit filed by several church-state separation groups over the matter. As previously reported, Warren resident and member of the Freedom from Religion Foundation (FFRF) Douglas Marshall submitted a request last year to the Downtown Development Authority to use the atrium at city hall on Tuesdays and Thursdays from 11 a.m. to 3 p.m. to run a “reason station,” where he would promote free thought. However, according to reports, Marshall requested the same times that the “prayer station” is utilized to offer prayers for residents. Mayor Jim Fouts denied the request, stating that Marshall’s display was meant to purposefully interfere with the “prayer station” and could lead to disruption. He remarked that FFRF seeks to remove God from public life and he would not allow Marshall, whom he called a “designated hitter” for the organization, to succeed in the group’s efforts in his city. Following the denial, Marshall asserted that Fouts’ refusal was a violation of his right to free speech, and denied that FFRF had anything to do with his request for the “reason station.” FFRF, the American Civil Liberties Union (ACLU) and Americans United for Separation of Church and State (AU) then banded to file a federal lawsuit against the city over the matter. On Monday, U.S. Magistrate Judge Michael J. Hluchaniuk approved a settlement with Warren officials to allow Marshall to have the display. As part of the agreement, the city will pay $100,000 in legal fees to the ACLU to cover expenses associated withe lawsuit. 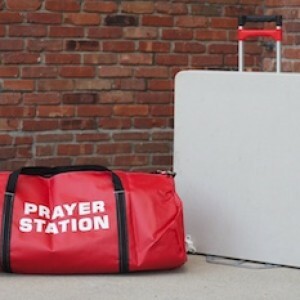 “The reason station will be allowed to operate on terms not less favorable than the terms granted to the prayer station,” the settlement reads. A statement has not yet been released by the city. This is not the first time that Marshall has tussled with Fouts in the courts. In 2011, he and FFRF sued the City of Warren for denying his request to place a Winter Solstice sign near an outdoor nativity scene. The federal courts ruled in favor of the city, noting that the majority of the city’s Christmas scenery was secular in nature anyway.